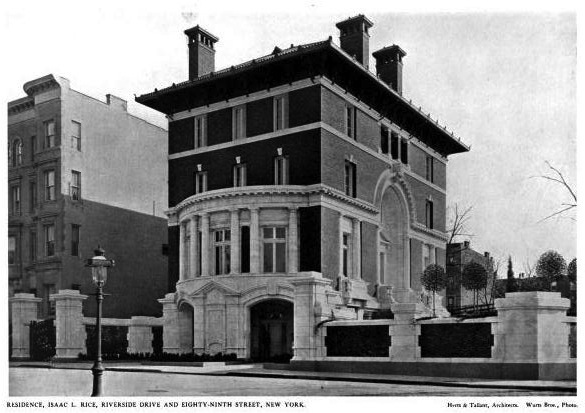 'Villa Julia', the Isaac L. Rice residence designed by Herts & Tallant between 1901-1903 at 346 West 89th Street in New York City. Rice was an attorney, financier and inventor. He sold the residence in 1907 to Solomon Schinasi who would die there in 1919. 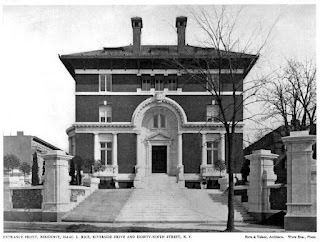 The Schinasi family sold the house to Yeshiva Chofetz Chaim in 1954 (later Yeshiva Ketana). Click HERE for Christopher Gray's Streetscapes article on 'Villa Julia' and HERE for more. Click HERE for Rice's 1915 NYTimes obituary. Click HERE to see 'Villa Julia' on google street view. ^ That happened and they tried. Read the Gray article...it talks about the preservation battle that took place. What a bold and loopy design. Some of it shouldn't work, but it does. Gold star.